Tracking Foreveil is a single player campaign. It provides a fixed set of bases (nodes) for you to fight against. Upon the completion of a node, a small reward of gold is given and you will be able to progress onto the next node. The objective of the campaign is to progress through all the bases and defeat the ice dragon “Foreveil” on the final node. Upon completion of the campaign, you will receive Foreveil as a dragon Ancient. Foreveil was the eldest son of the leader of the Snow Leopard Clan, one of the many clans that filled the icy realm he was born into. He was an accomplished warrior and unbeaten for many years, until he met his match in a young female warrior from the Ice Bear Clan, who bested at the annual clan games. Foreveil became enraptured by Birna, and she by him. It was not long before the two warriors fell in love and become betrothed by one another. But the union of two such powerful clans did not please everyone. On the their wedding night, a witch doctor from the White Eagle clan cursed the lovers to never be together. The resulting curse caused Foreveil to mutate into a huge dragon, disrupting the wedding celebrations and bring the Ice Bear and Snow Leopard clans to the brink of war. In order to prevent this Birna attempted to kill herself and Foreveil in the hopes that they would be together in the afterlife. However, the curse was a powerful one, stronger than death itself. The campaign story picked up when Foreveil has already been changed into the ice dragon form. General Alandra and you are trying to track down Foreveil and convince him to fight for you before he was corrupted by the Ruin. Snow Hawk’s Reach - (difficulty: Easy). Objective: Find Foreveil, the Ice Dragon Ancient, before the Ruin do. This is the start of the quest. Reward: 300 gold. Chillspine Peak – (difficulty: Easy). Objective: The Ruin have converted another Stronghold to their side. Destroy it! This is a training stronghold and designed to show how basic defences work. Reward: 400 gold. Winterheart – (difficulty: Easy). Objective: No time to rest. Commander. Another base has fallen to the Ruin. Eradicate them all! This base is mildly harder than the previous one. It is recommended that you have practiced battling via the normal “Battle” mode before attempting this base. Reward: 500 gold. The Frozen Barricade – (difficulty: Easy). Objective: With Birna’s help we can breach the walls of this Stronghold. This is the first time you will encounter Birna, who is also an Ice Ancients and can be found inside Ancient and Relic Chests. Birna joins you in the quest to hunt down Foreveil. Reward: 1,000 gold. Note: You will be given the ancient "Birna" to complete this mission. Endless White Glade – (difficulty: Easy). Objective: This place was probably very beautiful before the Ruin invaded. This is simply another base to take out. Reward: 1,150 gold. Snow Leopard Outpost - (difficulty: Easy). Objective: This will be tough to conquer. Upgrade your Troop Portals to stand a chance. As the description suggested the last few bases requires upgraded troop portal to complete. It is advisable that you have at this point leveled up your Stronghold to level 4. Reward: 1,300 gold. Ice Bear Lodge – (difficulty: Easy). Objective: One last Ruin Stronghold to destroy before we reach Foreveil. The minimum stronghold level requirement for successful completion of this quest is Stronghold level 4 with upgraded troops. Reward: 1,450 gold. Foreveil’s Roost – (difficulty: Normal). Objective: Free Foreveil from the grip of the Ruin. You finally track Foreveil down in the Ice Den where he was battling the corruption of Ruin. Once you have defeated Foreveil, he regains his senses and thanks you for preventing him from nearly killing Birna. He then joins your Ancient collection. It is recommended that you use him as your dragon on the roost. Reward: 2,000 gold. There is a Quest reward for completing this campaign, "The Snow Leopard Champion". You will receive the Ancient: Foreveil. “Tracking Foreveil” becomes accessible once you have completed the tutorial. However, it is recommended that you do not attempt the campaign until you have at least reached Stronghold level 3. Each battle node will consume a Battle Stone. It is advisable to practice battle strategies by doing the usual battles first. The loot from usual battles should also help with the upgrade costs. Use a bonus troop or request troop donations from your kingdom mates to help with the quest completion! Foreveil can be used as both the “Dragon on the roost” and the Ancient. As a superior dragon, Foreveil does less damage per second (dps) as compared to rare or epic dragons at a lower level. Only use him as a roost dragon if you do not have a “rare” or “epic” dragon in your collection. This single player campaign is accessible once you complete “Tracking Foreveil” - THE FROZEN NORTH. It is shown on the battle map as “Trickster's Wake” - THE ARID DESERT. Note: the difficulty ratings are for a Stronghold level 6. Firebeer Gulch - (difficulty: Normal). Objective: Fight your way through this Stronghold and avoid the local brew. Reward: 35,000 gold. Suntrap Valley – (difficulty: Normal). Objective: Another Stronghold bewitched by Erasmus. If you don't strike first, then they will. Reward: 37,500 gold. Note: this is the first campaign which introduces the Confusion Tower (Zillah's Insanity Potion). Parched Peak – (difficulty: Hard). Objective: Jal will help you fight back against Erasmus' powers of confusion and illusion. Reward: 40,000 gold. Note: You will be given the ancient "Jal" to complete this mission. The Red Barrens – (difficulty: Impossible). Objective: Erasmus' magic is strong here. You will face much resistance. Reward: 45,000 gold. Flame's Rest – (difficulty: Impossible). Objective: We're gradually catching up to Erasmus. Soon we will have to face his trickery head-on. Reward: 50,000 gold. Erasmus' Stronghold - (difficulty: Impossible). Objective: You've finally reached Erasmus. But can you stand against the deviousness of the Trickster Ancient? Reward: 75,000 gold. There is a Quest reward for completing this campaign, "Jal's Vengeance". You will receive the Ancient: Erasmus. This campaign was only available for a limited time, during the Winter's Bane event. There was a Quest reward for completing this campaign, "Banemaw's Secret". This single player campaign is accessible once you complete “Tracking Foreveil” - THE FROZEN NORTH. It is shown on the battle map as “Wrack and Ruin I” - OBLIVION'S EDGE. Note: the difficulty ratings are for a Stronghold level 9. High River Run - (difficulty: Normal). Objective: Destroy this Ruin Stronghold on the way to finding Talasin. Reward: 50,000 gold. Note: This is the first glimpse of the "Dark Primus Well" building. Shimmering Falls - (difficulty: Hard). Objective: Talasin and the Ruin passed this way leaving chaos in their wake. Reward: 55,000 gold. The Crystals Rapids - (difficulty: Hard). Objective: Cleanse this Stronghold of the Ruin's corruption. Reward: 55,000 gold. Den of Talasin - (difficulty: Hard). Objective: Talasin's sister Emberclaw will aid you in this mission. Reward: 50,000 gold. There is a Quest reward for completing this campaign, "Sibling Rivalry". This single player campaign is accessible once you complete “Wrack and Ruin I” - OBLIVION'S EDGE. It is shown on the battle map as “Wrack and Ruin II” - FORGOTTEN HILLS. The Verdant Hills - (difficulty: Hard). Objective: Clear out this Ruin infected Stronghold. Reward: 100,000 gold. The Downlands - (difficulty: Hard). Objective: Push through the Ruin threat and find out what has become of Viscaria. Reward: 110,000 gold. Whispering Heights - (difficulty: Hard). Objective: We are nearing the nature dragon's lair. Reward: 120,000 gold. Dragon's Crest - (difficulty: Hard). Objective: Protect a sleeping Viscaria from the Ruin. Reward: 150,000 gold. There is a Quest reward for completing this campaign, "Viscaria's Dream". There are 5 daily campaigns which rotate in order throughout the 7 day week. Order: Fire → Lightning → Nature → Ice → Death → (loops back to Fire). The Campaigns will appear in certain locations on the Estara map each day. Each daily campaign represents one of the 5 Ancient elements. You will have 3 bases to attack, each of which cost 1 battle stone and progressively gets harder. All the spell towers will be replaced with the daily elemental ability. In order to do the campaign, you must have at least a Strong Hold level 6, and 1 ancient of the same element. 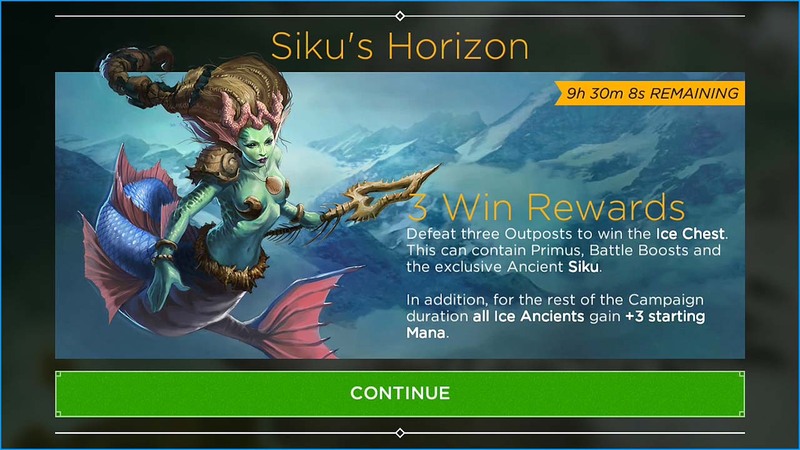 Once you complete the campaign, you will be rewarded with an element chest, plus an additional 3 starting mana for the remaining of the day. Note: The 3 starting mana is only appicable to ancients of the same elemental class as the campaign. Additional reward: +3 starting mana for all Fire ancients for the rest of the day. Additional reward: +3 starting mana for all Lightning ancients for the rest of the day. Additional reward: +3 starting mana for all Nature ancients for the rest of the day. Additional reward: +3 starting mana for all Ice ancients for the rest of the day. Additional reward: +3 starting mana for all Death ancients for the rest of the day.